What is it about Melbourne Cup Day and tomatoes? Well according to the locals, it's traditional to get your hands in the soil and plant out tomato seedlings on Melbourne Cup Day. Whether or not this is true, having a midweek public holiday is a great excuse to get out in the garden. It certainly is tomato planting season, as the earth warms up and winter veggies around the plots and communal beds go to seed. 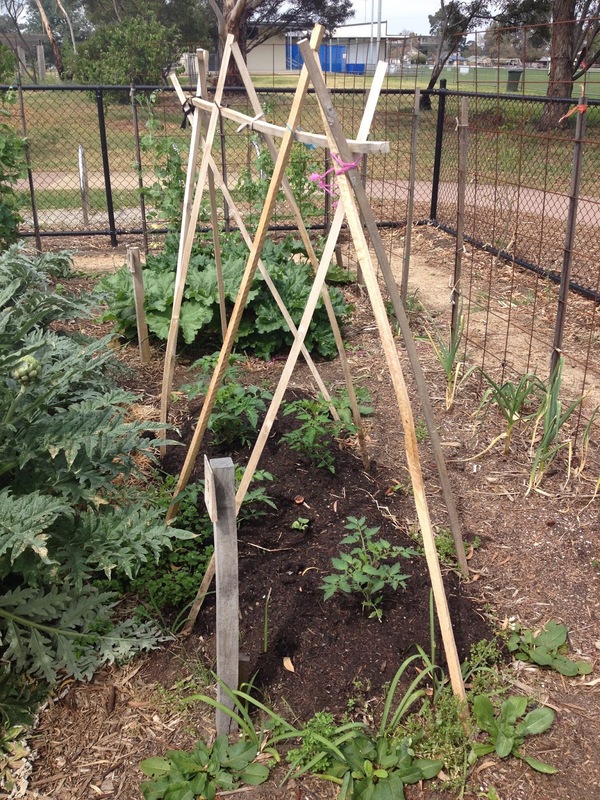 Here are a few tips about tomatoes and also the all-important trellising of them. Planting: 40-60cm apart. Plant when seedlings are >10cm tall for best results. If the soil stays soggy where you want to plant, build a raised bed. Soil: Tomatoes like a pH of 5.5 - 6.8. They prefer well-drained soil that is rich in organic matter. Companion planting: Good with - Parsley, basil, marigold, nettles, carrots, asparagus, chives, roses, onion, nasturtium and garlic.